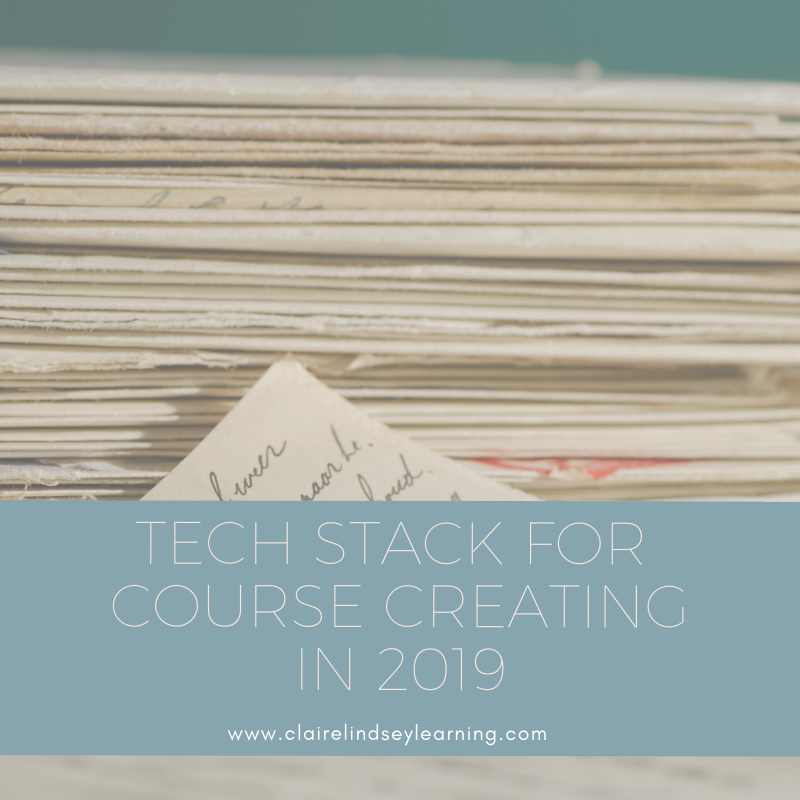 I thought it would be useful to let you know the tech stack I’ll be using for creating online courses in 2019. This collection is chosen for ease of use and affordability. This coming year, more than ever, you’ll see increased support for creating online courses. Platforms and tools are making it quicker and easier to source and produce professional and engaging content. If you are quick and act before the end of 2018 you can take advantage of 30% off one of the tools that I recommend. Read on to find out. There are a few reasons why I’m a big fan of Thinkific for hosting your online courses, they have their own video hosting, great customer support, they pay you faster and you can start for free. The ability to host all of your video content within Thinkific is a big advantage. This avoids the need to use Youtube or Vimeo, and means you can save a lot of money on hosting costs in the long run. You can upload directly from Dropbox or your google drive, which is faster. They also have a bulk uploading option that is super time saving. You are allowed to publish three courses before you have to start paying. You don’t get all the bells and whistles for this, but you do get a good shot at making your course viable before you have to invest. I prefer this model over the 14 day free trial models that many services use. Course creating can take a long time and this free plan lets you really get into the sandbox and try all your ideas out. The average user will find the site very well organized and the interface is intuitive to use. Explanations are dotted around the interface via hover and prompts. If you do get stuck on something, their customer support has been very helpful for me in the past. They are based in Vancouver, so PST are their best hours. Outside of these hours, the Thinkific facebook group is active and supportive. For quick recordings I use Loom. It is free which is the big draw. It works as a chrome extension, which means you can record on the fly without the need to start up external software. Short videos work well with Loom and this encourages bitesize pieces of learning. If a student watches five short videos instead of one long video they feel as if they are making progress and can easily return to the topics that they find the most challenging. If you are Mac based and serious about creating videos for your online courses, this is a must. It has been part of my tech stack for over 5 years. It is continually staying ahead of the curve, the latest upgrade gives you the option to export to Instagram, which is growing as a marketing platform for course creators. If you have any money to invest in your course creating this is my biggest recommendation. If you are a Mac person, then you can record your screen with a quick command-shift-5 as I wrote about in my Mojave post. When I’m using Loom, I just use the microphone on my MacBook Pro, it works fine for a quick video. For less disposable videos, those that are going to sit inside your courses for a while it is worth investing in a decent microphone. I use the blue snowball, the sound is enhanced and I also use it because I like the way it looks on my desk. This does the job for slides. Keep your slides simple in design with lots of whitespace. Your slide deck can be rich in content, yet sparse slide by slide, what I mean by that is use more slides with small bits of easy to digest content on each of them. Google slides makes it easy to collaborate and edit with a team or collaborator. The ability to download as pdf, makes it simple to create short e-books too. This is a free site that I detailed in my previous blogpost “Create fillable pdf’s” . Students love to have worksheets, checklists and notes as course reminders. PDFEscape is my go to. Canva makes everyone feel like they can be a graphic designer. I pointed her in the direction of the Canva design school they have now included on the site. This would be a good place to start if you have any doubts or need design direction. You can get good ideas and design guidance from looking through the templates they provide. I made the feature image for this blog post in less than 5, because I’d made one earlier and I knew I wanted a similar aesthetic. I just copied the original, retyped the headline, and switched out the background photo and it’s ready for Pinterest and Instagram. My goal for this article is to show that the tech needed to create your course is not expensive, it is readily available and you have options. I encourage you to go for the simplest option and start creating. Let yourself off the hook by telling yourself you are playing and you are going to redo it perfectly later (note to self). 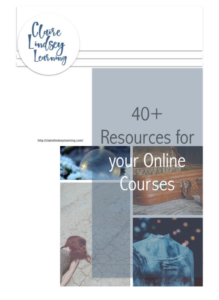 If you want more resources then you can download my 40+ resources for your online courses e-book. This has all the resources in it that I wish I had known about when I got started. I hope it will save you time and frustration. Let me know your tech stack, I know there are so many options now, and I’m up for finding out your best workflow.